Yes, for those that suffer from sweating excessively - lets say it's your under arm - use a loofah sponge to clean it, as well as the rest of your body. Remember, in step 1 of our stop sweating detox plan, you use the pure soap first, not with or after the loofah sponge. A loofah sponge is used for exfoliating the top layers of skin cells. What you remove one day by gentle exfoliating, is replaced by the next layer of skin cells beneath it. By removing the layers gently and slowly over several weeks, any under arm or other sweating pores that were blocked or damaged are opened up to function better and more normally, resulting in less excessive sweating, or the cessation of excessive sweating. The amazing loofah sponge is used for about 10 seconds per area of the body, adding about 2 minutes to your shower or bath time, and is used once per day. After using the loofah sponge, gently wipe yourself down with a wet face cloth or wet flannel. 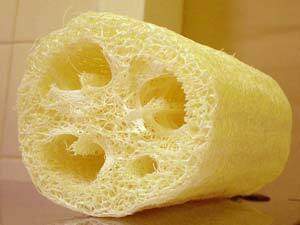 A natural loofa sponge, also known as a Luffa or Lufah sponge, is by definition a fruit from a Luffa aegyptiaca vines, that can be grown in the tropical and subtropoical areas of the world. The fruit is harvested, then processed to remove everything except what you see in the shops, as in the loofah sponge picture to the left. The loofah needs to be about 6 to 8 inches long and be a natural loofah sponge. Man made sponges, exfoliating gloves are not a suitable substitute, as their exfoliating ability may be quite different to the natural loofah sponge. The loofah sponge also needs to feel a little rough and a little scratchy when you use it - remember it has to exfoliate gently, so it needs to be a little rough and scratchy, not alot so. If your under arm sweating, or what ever body part is so afflicted, doesn't show improvement in about 14 days, it may mean that you have to try a a different loofah sponge. After using the soap and rinsing the soap off, you then use the loofah in the shower, or in front of a mirror if you need to see what you are doing. Soak the loofah fully, so that it is soft and squishy, then gently rub the area you want to treat [the area that you have excessive sweating from], using the loofah in circular motions. Around ten seconds per area. The key is gentle circular rubbing. In tight body areas, you may need to use one of the ends to gently exfoliate." My suggestion anyway, and please let me know how it works for you. Remember, it may take up to a month to see a valuable difference - hopefully it will work for you.